A heavy debt burden is like climbing a mountain with 100 pounds on your back. It never gets any easier unless you drop the weight. Fortunately, it’s possible to live a life without any debt! Eliminating debt and staying debt-free both require discipline and patience. But the freedom you receive is well worth the effort. 1. Make more money. The financial gurus are always recommending that those in debt spend less money. If you’ve already cut your expenses to the bone and are looking for more, nothing is more powerful than making more money. • You’ll be surprised by how much you can make when you make earning a priority. Most of us go through life only doing enough work to avoid getting fired. Imagine if you used your time with the intention of maximizing your wealth. • Making more money will allow you to get out of debt faster, provided your spending doesn’t increase. 2. Save. A healthy nest egg is one of the best ways to ensure that you stay free of debt. Even a small financial hiccup can result in debt if you don’t have the savings to handle the issue. 3. Be patient. You never need to accumulate any debt if you’re patient enough. There are people that never borrow money to purchase a car or a home. Instead, they save until they can write a check instead. • This is especially true with impulse purchases. Are you patient enough to wait until buying a new shirt or stereo makes good financial sense? 4. Avoid materialism. The less you need to buy, the easier it is to stay debt-free. Focus on the people in your life and contributing to others. Materialistic people face more financial challenges and are much more likely to accumulate debt. • What is most important to you? Do you really want an expensive car? Or do you just want to impress the neighbors? How much of your spending is ego-based? 5. Make sacrifices. If you have debt, you’ll have to make a few sacrifices to get out of debt. 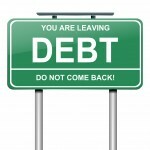 If you currently don’t have any debt, a few sacrifices will help to ensure that you stay out of debt in the future. • Make a list of the things that you need versus those that you want. Cut your budget until you’re free of debt. Then you can begin adding back a few things. 6. Prioritize. You might not be able to afford a grand piano, a trip to Hawaii, a swimming pool, and a new car. However, you might be able to afford one of those items. It’s all about priorities. Temper your expectations and decide what means the most to you. • If you’re going to spend money, spend it where you’ll receive the most utility. Limit your discretionary spending to those things that are most meaningful. 7. Pretend you make less than you do. There are people that live on 50% of their income. Could you do the same? It’s hard to lower your lifestyle, but it can be done. For starters, imagine that you make 10% less than you do and either save that 10% or apply it to your current debt. Imagine a life without debt. No mortgage, car payment, student loan, or credit card payment to hold you down. You can be financially free. Debt-free living is a lifestyle. It’s not a single event. It’s necessary to change your lifestyle and outlook if you wish to become and remain debt-free. Start making the necessary changes today. Soon, you’ll be glad you did.